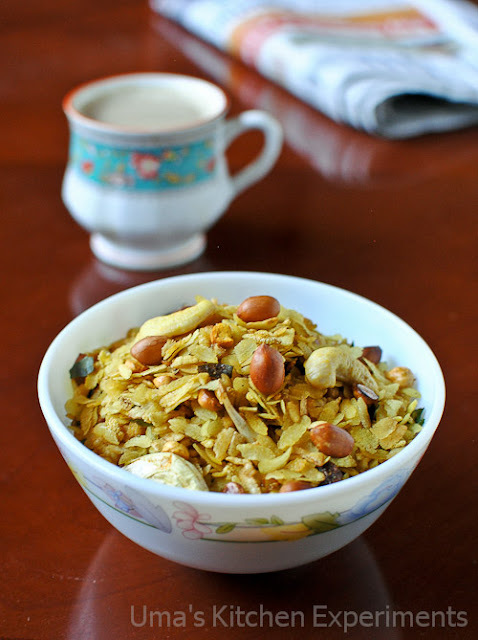 When you crave for some snacks during your tea time, try this quick 10 minutes aval mixture. It satisfies your craving as it pairs well with hot tea or coffee. The ingredients used in this mixture are also readily available at every household. 1) Heat oil in a wide pan. When it is hot, add garlic cloves, curry leaves, dry red chillies and asafoetida. Fry well till the curry leaves became crisp. 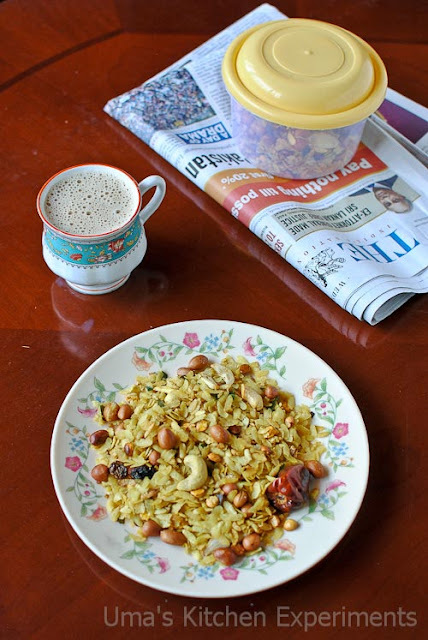 2) Add raisins, cashews, roasted Channa dal, peanuts. Fry till the nuts became slight golden brown and raisins became pulpy. 3) Add turmeric powder, red chilli powder, salt and sugar. Mix well. Make sure not to burn these masalas. If required reduce the flame at this stage to avoid burning. 4) Add aval and continue frying till the aval becomes crispy and opaque. 5) Allow the mixture to cool to room temperature and store it in a airtight container. 1) Make sure not to burn any masalas. Otherwise, you won't get proper colour for chivda. 2) You can fry all the ingredients separately and mix them later. 3) Adjust red chilli powder, salt and sugar as per your taste. Also, mix/shake the mixture well before serving or eating since salt and sugar always stays at the bottom of the stored container. 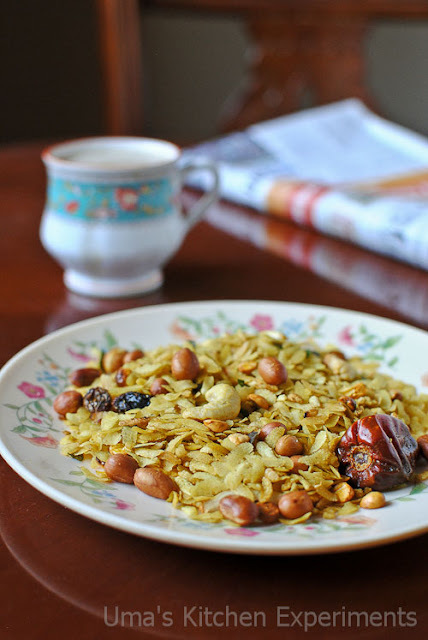 Crispy and delicous poha. Lovely snack. crispy, delicious and healthy snack..
looks very crispy and delicious!..lovely presentation! 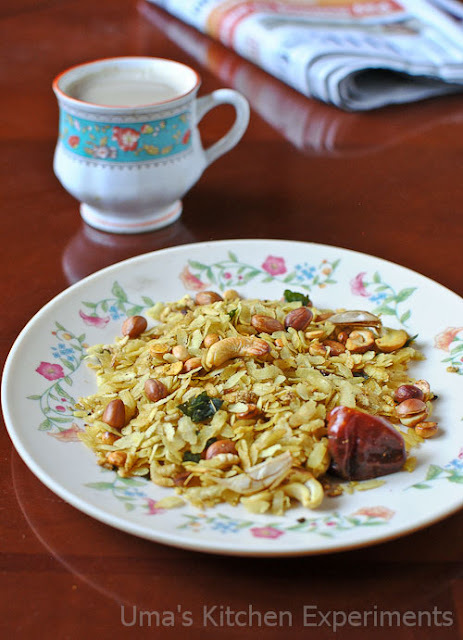 Absolutely yummy snack with a cup of piping hot evening tea. neat presentation.. perfect snack for evening..
@Bharathy, Thanks a lot for the words. Keep visiting.